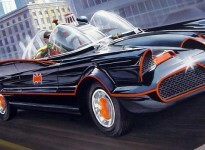 Remember a few short years ago when the Barris 1966 Batmobile license was just a lofty goal on many of our wish lists? Well be careful what you wish for. Or – be really thankful if they keep putting out great stuff. Eaglemoss is a UK company best most known for its well-done heroes figurines that accompany their vivid but kind of cheesy magazine subscriptions. (let’s face it – you buy them for the figures) They’re mostly limited to UK sales, but Diamond distributes them to comics shops in the US as well. Meaning – no, if you’re in the US you can’t order this directly from the company that makes it but you can bug your buylevitra.net local comics shop about getting one in for you. Or – you know, wait and get one on eBay like the rest of us. Update 3/29/2011: It’s been reported to me from a friend in the UK that these will be 1:43 scale. Clearly they’ve used the Hot Wheels 1:43 for the catalog/website photo, though it’s not determined yet whether they will end up using them (like the Danbury Mint did) or produce their own. 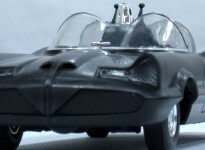 If they do use the HW cars, it’s a fairly lackluster diorama that doesn’t bring much new to the table but for a few bad interpretations of the TV Batcave machines. I just spotted this and I’ll be at my local magazine shop tomorrow morning to check it out. I will let you know what I find! I am in the center of the UK, so hopefully it will be available. this is a british version made from the mattell molds. Not available in the states. @Mick – Let us know what you think. You’ll see them before we do here. @Futurabat – Actually they should be distributed in the U.S. like all the other Eaglemoss stuff through Diamond via comic book/specialty shops, though we get them all much later than they do in the U.K. It certainly looks like the HW 1:43 in the photos but these could just be mock-ups for pre-ordering like some of the earlier Round 2 stuff was. Curious as to where you got the info about them being made from the Mattel molds? Looks like we won’t see these for a while. I have just been speaking with the publishers, and they told me they are “Testing” this series in only 2 cities here in the UK, to see if there is enough interest to go nationwide. Neither of these cities are anywhere near my home so I can’t collect in person, and the store I contacted won’t post them. I may subscribe, but the subscription form on the website doesn’t say how many issues will be published, and I don’t want to commit myself without knowing the total cost. I do know that these are NOT Hotwheels. They are a fresh casting from China. Which two cities Mick? I’ll ask some of our other U.K. members to keep an eye out. The 2 cities are Reading and I think,Stockport. I spoke to an assistant in W.H. Smith in Reading, one of the major retailers. She had in her hand, Issue No 1, and was expecting Issue No 2 in the store today, Thursday. So anyone in those 2 cities should be able to get it if they are fast. Only 1000 being produced initially, so a collectors item is there waiting for them! I have just subscribed for the first (5) copies that are being produced. Presumably more will be produced and launched nationwide if sales go well. I asked how many there will be in the series, I was told 80!!!!! 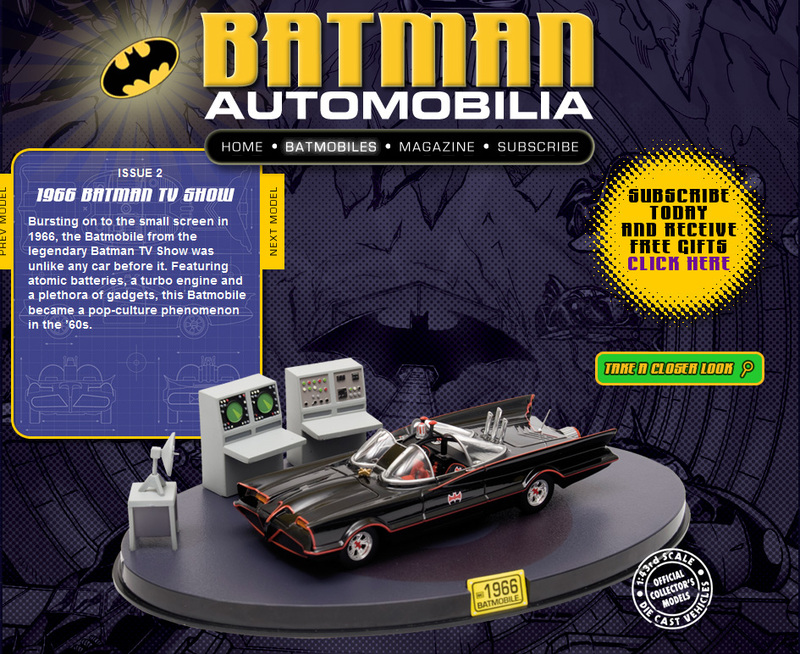 And each issue with a Batmobile!!! I don’t think so somehow! !